Style Patrol Style Patrol: Should We Lay Down This Burden? I lay [Character X] on the beam and lash her into place. I lay uselessly, unsure of what to do, when the [Y] decides for me. What's "wrong" with these sentences? Or is anything wrong at all? First, let's note that this book is narrated in the present tense (hence verb forms such as "decides"). Nothing wrong with that. Second, let's look at the use of the verb "lay." In the first sentence, the narrator is picking an injured person up and "laying" her down on a beam. "Lay" means "to put or place," and the verb has a direct object: Character X. 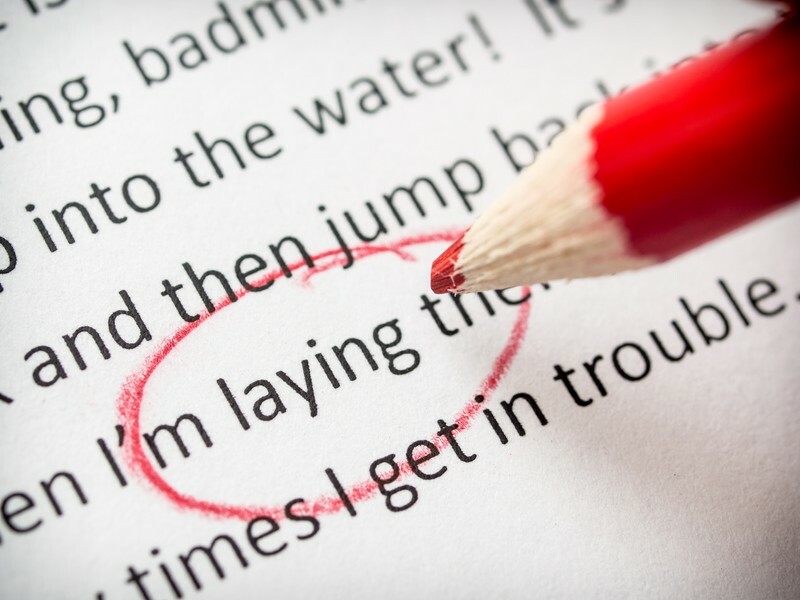 In the second and third sentences, the narrators use "lay" to mean "rest or recline in place." "I lay" has no direct object, only a prepositional phrase conveying location ("in my pallet"). In the case of "I lay uselessly," we can assume the character is "laying" somewhere, but again the act has no direct object. So what's the problem? Well, according to grammar books, only the first use of present-tense "lay" — with a direct object — is correct. Lay is a transitive verb. When you want to describe somebody reclining on a pallet in the present tense, no direct object in sight, the verb you actually want is the intransitive lie. Why is this so confusing? Why does everybody get it wrong all the time? (As an editor, I can attest to this.) Because, when we switch to past tense, I lie becomes I lay. Present: I lay her on the beam and run away to do something heroic. Past: I laid her on the beam and ran away to do something heroic. Past participle: I have laid her on the beam every day for a week now. Present: I lie in my pallet and try to sleep. Past: I lay in my pallet yesterday. Past participle: I have lain in my pallet for the past twenty days. Lay/laid/laid. Lie/lay/lain. It should be easy, right? No. It clearly isn't that easy. And there's a more important question: Does it matter? Grammarians — as well as actual users of the language — should take note (and the better ones already do): When the majority of users get something “wrong” but don’t consider it to be a problem, then it probably isn’t wrong. It’s instead an indicator that language change is taking place…or already has taken place. That seems to be exactly where we are today with lie and lay. In other words, nope, it doesn't matter. If the majority of English speakers say, "I lay in my pallet" instead of "I lie in my pallet," we'd be pedantic to correct them. Usage has shifted, leaving grammar rules behind. What about the written word? Daly says that "I very rarely catch a misuse of lie or lay in print." That hasn't been my experience, as the examples above attest. I frequently see "lay" used for "lie" not just in unedited copy, but in printed newspapers and books. The novel quoted above is especially interesting because, as far as I could tell, it "misuses" the two words with utter consistency. It's never "I lie in bed," always "I lay in bed." So this doesn't look like a case of editorial carelessness or "editors not editing." The idea that modern editors don't edit is one of those notions that lots of people seem to accept just because they've heard it so often. In my personal experience, editors are as proactive, thorough and sharp-eyed as they ever were, and I have the mss. full of tracked changes and comments to prove it. But in some cases, their priorities may have shifted. Could this (large, respected) publisher have written the acceptability of "I lay in bed" into its style sheet, based on almost universal usage? I don't know, but I wouldn't rule out that possibility. Or perhaps the editor gave special consideration to the style in which this novel was written. First-person present tense is an informal, immediate mode that suggests we're hearing the narrator's running internal monologue. Most people don't think in well-rounded, grammatically impeccable sentences, as Faulkner and Joyce knew. So why should these characters? Why not let them think the way they might speak? Either way, I can see the justification for using "lay" instead of "lie" here. But will I ever choose to do this in my own writing? Probably not, unless it appears in dialogue. Will I let this usage slip into Seven Days on my watch? No, unless it's part of a quote. To me, "I lay and contemplate existence" just doesn't sound right. Language changes, but on certain points, some of us remain hard-asses who refuse to lay our scruples to rest or let common mistakes lie. Style Patrol is a monthly blog column for word nerds.